The story of Culpeper County, Virginia, is a unique one in Civil War history. Nestled in one of the South’s most strategically important locations, it was occupied by the Northern army, recaptured by the Confederacy, and finally ceded to the North. Told largely through diaries, papers, and correspondence of residents, common infantrymen, and such eminent personalities as Robert E. Lee, Walt Whitman, Ulysses S. Grant, Clara Barton, and Stonewall Jackson, all of whom spent time in Culpeper, this story wonderfully captures both the intimacy and grandeur of war. Seasons of War moves from the primitive squalor of filled hospitals and the daily indignities of a soldier’s life to the editorials of a local newspaperman and the struggles of women and children left to the mercy of an occupying and hostile army. While famous Culpeper visitors like Lee and Whitman compose dispatches and lyric poetry, private citizens mourn their dead and defend their homes. Here are the very personal aspirations, losses, and sometimes gruesome banalities of an unforgettable American war. Sutherland’s account of the war is unlike any other. Both a military and a social history, it details the life of a single Confederate community without losing sight of the titanic struggle of a nation divided. It allows readers to join the councils of Lee and Grant while sharing the letters of young couples separated by war. We frolic with the fun-loving Jeb Stuart, experience the confused terror of men in battle, feel the anguish of civilians surrounded by contending armies, observe the tensions between neighbors with different loyalties, and sense the joy of liberated slaves. 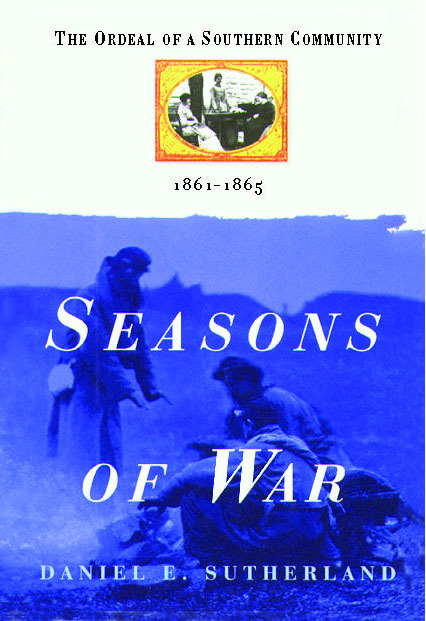 Written in a daring style that thrusts readers into the vortex of war, Seasons of War tells the story of a place and a nation. It is a tale by turns heroic and mean, hopeful and bleak, humorous and grave. It is a story of the American people—Northern and Southern, white and black, free and unfree—at the defining hour of their history.